Botox® injections are performed to provide temporary reduction of moderate-to-severe frown lines and other wrinkles on the face. This safe, effective process minimizes fine lines and wrinkles by relaxing specific muscles in the target areas. Botox® injections are used every three months to relax specific targeted muscles to reduce the appearance of frown lines and other wrinkles caused by animation. What is involved at the Botox® consultation? 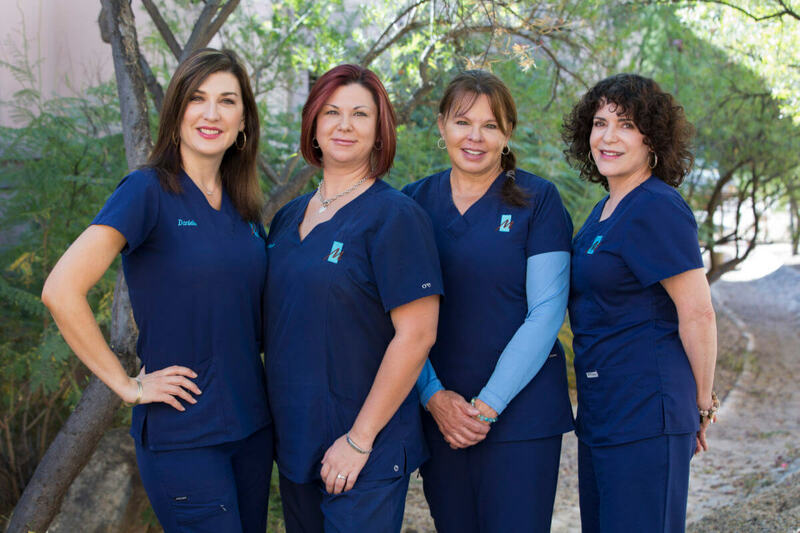 When you come in for your initial consultation, you will meet with one of our talented and experienced injectors; Jeanne Bernstein RN or Danielle Moser PA-C. Jeanne or Danielle will examine your face and discuss your goals to determine if you are a good candidate for this procedure. They will discuss areas that Botox® injections can improve for you and your face as well as discuss the risks, complications and alternatives to the use of Botox®. You will have an opportunity to ask questions and make an informed decision as to if Botox® injections are right for you and your desired cosmetic outcomes. If you choose to have Botox® injections, you may choose to have them performed the same day or you may choose to return at another time for the procedure. How do I prepare for Botox® injections? There is really no preparation needed to undergo Botox® injections. These injections can easily be performed on your lunch break with little to no recovery. How are Botox® injections performed? Botox® injections are performed by one of our experienced injectors. A very small needle is used to inject a specific amount of Botox® into the areas of concern. At times numbing medication is applied before your injections or ice may be applied for comfort. What should I expect after Botox® injections? You will not see results from your Botox® injections for about eight to ten days. It takes some time for the Botox® to “kick in” and begin working. You may notice some tenderness in the injection areas and at times some small bruises may be seen. These are typically small and can be covered easily with makeup. You may return to your regular routine very quickly after your injections. What are the benefits of Botox® injections? Botox® injections work safely and effectively to temporary reduce the of moderate-to-severe frown lines and other wrinkles on the face. This non-invasive procedure is the most popular cosmetic procedure in the United States. Botox® injections can soften the frown lines, crow’s feet and other superficial wrinkles making you appear more youthful and refreshed. What are the risks of Botox® injections? Botox® injections have both aesthetic and health risks, and it is your personal decision whether the benefits outweigh the risks. Common risks include asymmetry, bruising at the injection site or tenderness at the injection site. Although extremely unlikely there are also more uncommon, complicated risks such as the botulinumtoxin spreading to other parts of the body and cause botulism-like signs and symptoms such as muscle weakness throughout the body or vision problems. For a full list of risks, go to www.plasticsurgery.org.